The minimalist Toronto wall hung bathroom suite is perfect for creating a boutique feel in your bathroom. 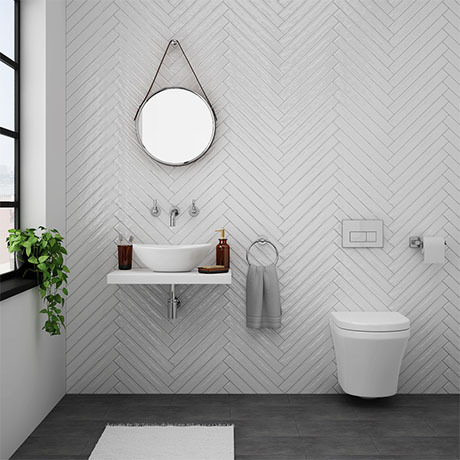 Features a stylish wall hung counter top shelf with Casca 410mm wide oval shaped counter top basin, a round wall hung toilet and a dual flush concealed cistern wall hung frame. It's wall hung design makes your bathroom look much bigger, tidy and it is easier to clean. Basin comes with no tap holes and is to be used alongside a counter or wall mounted outlet. Shelf is supplied undrilled to allow flexible positioning for your basin and tap. The wall hung toilet fixing frame has a small, compact design making it perfect for under windows or inside low-wall installations. Frame is supplied with a striking modern chrome finished dual flush plate.